I had posted the article below on Defense Minister Fumio Kyuma earlier today thinking I had some time for you all to read it but apparently not. 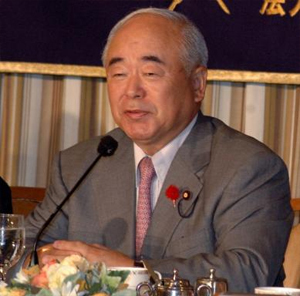 Defense Minister Fumio Kyuma resigned Tuesday to take responsibility for controversial remarks he made over the weekend that were interpreted as justifying the U.S. atomic bombings of Japan in 1945. This comes as a blow to Prime Minister Shinzo Abe who is gearing up for the July 29th House of Councilors election. Japan’s government could see a political musical chairs occurring soon due to Abe’s recent comfort women issue and his attempt to rewrite the history of Okinawa’s military involvement in World War II. Here at MaoChan, it is important to take some time and remember that important things are occuring, such as Baraka Obama rocking the contribution wagon to other political issues such as the one with Japan’s Defense Minsiter. Fumio Kyuma has/is in the process of extracting the foot out of his mouth with comments recently made about how he saw the atom bomb attacks in World War II as inevitable. This has sparked bomb survivors and opposition parties who are calling for his dismissal. 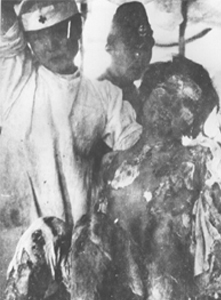 When I went to the Hiroshima Peace Museum, I was sickened by the brutality and carnage that is invoked by the horrific imagery that is captured in the photos there. To think that people were subjected to this torture is outlandish once you have gone there and seen things such as human skin fused to clothing. I understood immediately why Japan stands completely against nuclear weapons and oppose anyone who thought that the use of such force against humanity is something to be trivialized or warranted. The above photo is a real photo of a victim who was alive at the time of the picture. I hate using the phone. There seems to be a total lack of gundanium when I use my normal phone until now. From the country where they sell everything wrapped in Gundam, including condoms (Gundoms) & jelly drinks, is an internet protocol phone that will allow you to make your calls while having the full Gundam experience. 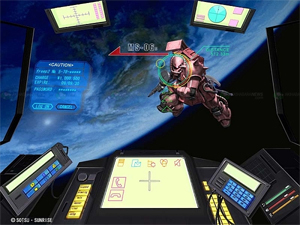 Coming from KAGA Electronics and Taxan, the software will turn your computer and you* into a lean, mean, gundam fighting machine that also makes calls. Time to strap in and fight for the safety of everyone on the colonies. *It won’t turn you into anything but a dork.